This is a spell to control fire. This spell was sent in by Brianna C. Thank you Brianna for sending it in. If you have any interesting spells please send them to me and I’ll post them on the website. You can also post your spells in your own online book of shadows on my Witchcraft Message Board. Thanks for visiting the website! This spell should be done on the night of the Imbolc. Imbolc is a fire festival and it is used to mark the beginning of spring. On the night of imbloc take your supplies and at 3 am start this ritual. Throw in the fire mix and stare into the flames. When you feel one with the flame try to move it with your mind. 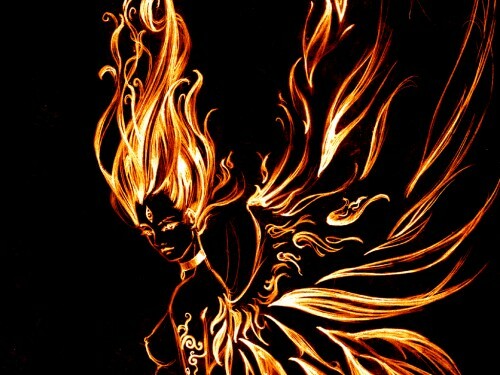 The flame may flicker or flinch you should know if it was done by you as you send bursts of energy. Make sure there is no draft in the room and this spell is best done in complete darkness. Caca in Roman mythology is fire Goddess. You can read more about the powerful Caca on wikipedia. Please leave all questions in the comment section below!